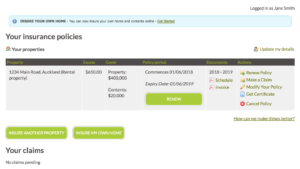 Insuring your home, holiday home, rental, or multi unit rental property with initio is fast and simple. You simply get a quote, follow the steps to sign up, make payment and gain access to your dashboard. You can literally take out insurance in less than 5 minutes. 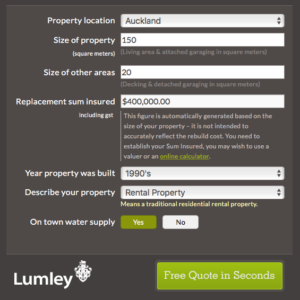 Head to the initio website and enter the property details into the seven question quote calculator. To help you answer any of the questions, we have put together a quote checklist so that you can have all the details on hand before you start. Now that you have your quote, you can choose what additional cover you want. 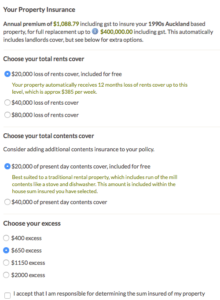 You can increase the Loss of Rents, value of your Contents and choose your excess. 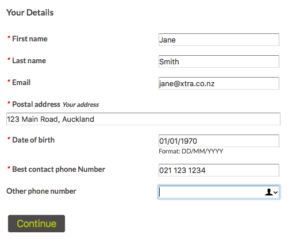 Let us know your personal details including your name, address, email and contact numbers. When your policy is due for renewal we will send emails to this email address, inviting you to renew for another year. This information can be updated later by logging into your dashboard. 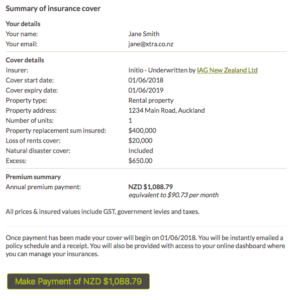 Next you enter the details of the property you are insuring. 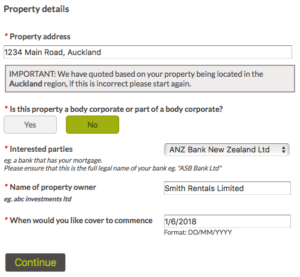 This is where you confirm the address, owner’s name (could be owned jointly, in a trust or a company) and any interested party, which is generally the name of the bank holding a mortgage over the home. You can choose to start your insurance anytime from today, until 30 days in the future. 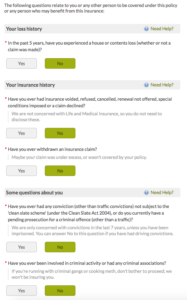 Finally we ask you some questions which you would typically find on an insurance proposal form. They include your loss history, insurance history, criminal history, the property’s use and history. Depending on your answers to these questions, we may need refer your application to a human to check over before confirming cover. Otherwise it is time to make payment. 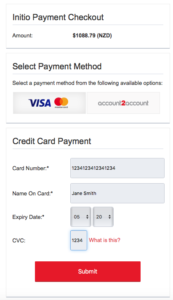 Payment is provided via a secure instant online facility. Annual payment can be made by credit card, debit card or Account2Account (where the payment is transferred from your bank account). Your cover is confirmed as soon as the payment is accepted. Now is your opportunity to rate your experience and let us know your feedback, this is completely optional, but we love to hear from our customers. You will also receive an email from us with your policy documentation and a schedule which can be forwarded to your lawyer / bank as a certificate of insurance. You can access your dashboard immediately, and will receive an email with your login details. The system generates a password for you, which can be updated once your in your dashboard. 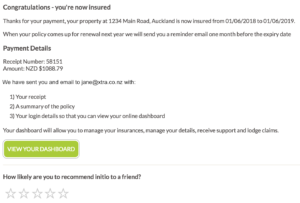 Your dashboard is the place where you can manage your insurances – update your details, make a claim, change the property owner or interested party and request updated certificates of insurance. That’s all there is, you have insured your first property. 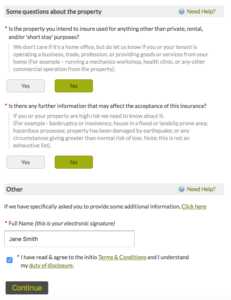 To add another property go to your dashboard and click “add another property” and follow the steps to insure it too.